Julianna Pena put on a great display of control in this fight as Jessica Rakoczy saw virtually no offense. Pena took Rakoczy down right away and tried to establish her ground and pound game, but Rakoczy did a good job in moving around and getting out of harms way. Rakoczy pushed Pena off of her and made it back to her feet, only to get taken down in the middle of the octagon. She would stay there for the remainder of the fight. Pena transitioned from half guard to side control and roughed up Rakoczy with forearms and elbows to the face. Pena would eventually transition to mount where she would ultimately end the bout. She slammed punches, forearms and elbows onto the skull of Rakoczy for what seemed like a minute before the referee separated them with only a second left in the round. Rakoczy was one second away from being saved by the bell, but the fight should have been stopped long before that so there is no need for controversy. 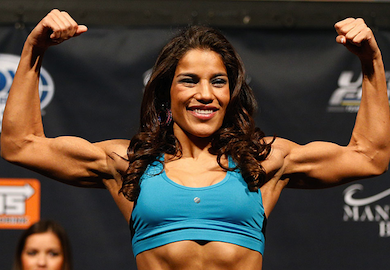 Julianna Pena was awarded a Harley Davidson Motorcycle and a plaque for winning the Ultimate Fighter Season 18 Women’s Bantamweight Tournament.